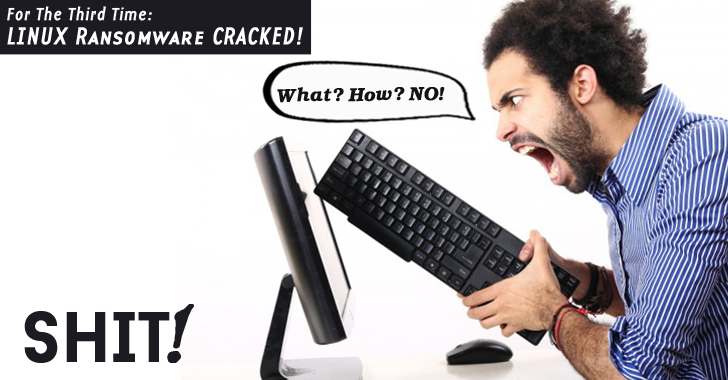 EPIC Fail — For the Third Time, Linux Ransomware CRACKED! Ransomware is now a common practice for money-motivated cyber criminals. It's basically a type of software written in any system-based programming language that has the ability to hijack victim’s computer, encrypts files and then ask for a ransom amount to get them back. One such ransomware dubbed Linux.Encoder targets Linux-powered websites and servers by encrypting MySQL, Apache, and home/root folders associated with the target site and asks for 1 Bitcoin ($453.99) to decrypt those crucial files. But, the good news is it is very easy to get rid of it. The Malware author released the third version of the Linux.Encoder ransomware, which security researchers from Bitdefender have managed to crack, yet again, after breaking previous two versions. However, before the team managed to release the Linux.Encoder decryption tool, the third iteration of Linux.Encoder ransomware, which was first discovered by antivirus maker Dr.Web, has infected a nearly 600 servers worldwide. Though victims who got infected by the third version of Linux.Encoder ransomware doesn't have to pay any ransom to get your important files back, and they can simply unlock it using Bitdefender's Linux.Encoder decryption tool to unlock their files. But the epic part here is even after the successful decryption of its previous Linux.Encoder ransomware versions, the group of ransomware creators, were still not able to write a perfect code for its third version. "As we expected, the creators of Linux.Encoder have fixed their previous bugs and have come up with a new and improved variant," says BitDefender boffin Radu Caragea. "Luckily for the victims, the new variant of Linux.Encoder is still vulnerable to key recovery attacks." It seems that the malware authors of Linux.encoder ransomware are newbie programmers who are just motivated by the success of other popular ransomware such as CryptoWall and CryptoLocker. This incident shows that there could be hundreds of other young newbies who are developing their own ransomware in order to earn money like other organised cyber criminal gangs. Moreover, it would be easier for law enforcement agencies, like Europol, to trace such immature programmers, as they might not be perfect in hiding themselves.